HexaCorp SharePoint add-ins improve productivity and driver user adoption. HexaCorp has developed several SharePoint add-ins that are designed to fill gaps in SharePoint platform and extended its capabilities. Our SharePoint add-ins are built with users in focus and have a natural and easy user interface. 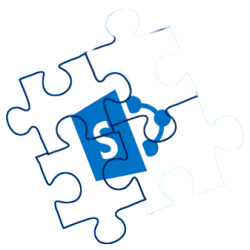 Our SharePoint add-ins guarantee productivity improvement for SharePoint users and administrators. We are continuously adding features and extending our SharePoint add-ins. If you would like to keep up-to-date on our SharePoint add-ins, please contact us. If you want our team of experienced SharePoint developers to help with developing customized SharePoint add-ins for your business in SharePoint on-premises or SharePoint Online, please reach out to us. HexaCorp Copy/Move Add-in allows users to easily Copy or Move list items from one list to another within a SharePoint site. The Add-in provides a simple yet powerful mechanism for users to manage content across lists. HexaCorp Clear List/Library Items add-in provides an easy mechanism for users to delete/purge all items from a SharePoint list or library. The add-in allows the user to delete items in Custom lists, Document libraries, Picture libraries and Asset libraries. Selected Item Print add-in provides an easy mechanism for users to print the selected items from a SharePoint list or library. The add-in allows user to print items in Custom lists, Announcements, Tasks, Document libraries, Picture libraries, Asset libraries, Form libraries and Wiki Page libraries. HexaCorp Multiple Documents Check-In Add-in allow users to look for all documents that are checked out by them in a SharePoint site and Check-in or discard the checkout.